The snow leopard is not only a trademark for DYNAFIT, but is also a role model and symbol of all of the characteristics and abilities that ensure life and survival on the mountain. That’s why, since 2007, DYNAFIT has supported the non-profit organization, Snow Leopard Trust (SLT), founded in 1981. The SLT advocates tirelessly to protect the endangered snow leopard from extinction. As a part of our partnership, DYNAFIT assists the Snow Leopard Trust in the best possible manner with donations, gifts and international media and communications support. Find more about the collboration here. DYNAFIT has been a member of the European Outdoor Conservation Association (EOCA) since early 2013. EOCA is an association consisting of 126 companies from the outdoor industry. The vision of this cooperative effort is to support selected conservation projects by focusing the industry’s financial resources. In 2013, DYNAFIT won financial support for a project it submitted aiding in the protection of snow leopards. Read more about the project here. For more than 25 years, the American Mountain Guides Associations has been (AMGA) dedicated to support the mountain guide community with outstanding education, standards and certifications to enhance the quality of services provided to the public. The AMGA is known as the voice of all American mountain guides and stands for professionalism and continuity. Mountain guides from all of France have united under the umbrella organization National Association for Mountain Guides - Syndicat National des Guides de Montagne. Established several years ago, this partnership helps DYNAFIT respond in a targeted way to the needs of mountain athletes in its product development. As the umbrella organization of Italian mountain guides, The “Collegio Guide Alpine Piemonte” is the voice of guides. This group advocates for the rights of Italian mountain guides and supports them with continuous education, for example. This cooperative relationship greatly enriches DYNAFIT since the enormous knowledge of the mountain guides can be directly incorporated into product development. 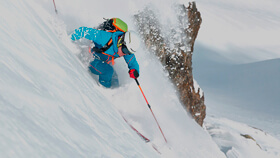 Since 2012, DYNAFIT is a proud partner of the Patrouille des Glaciers (PDG). The PDG is an international military ski mountaineering competition organized by the Swiss Army. Civilian ski patrol members may also participate. This one-of-a-kind race is characterized by the course length, demands of the high-alpine terrain, its altitude and course profile. It is likely one of the toughest ski mountaineering races which DYNAFIT supports with product discounts for athletes.